Awareness of the importance of good mental health has been a hot topic for some time. 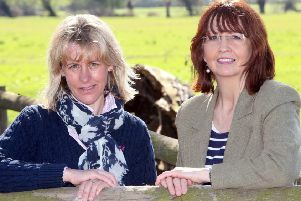 Now, a charity has chosen to focus on the impact of mental illness in farming communities as one of its key goals for 2019. And one of the ways they hope to raise money is by collaborating with an ear tag manufacturer . UK company Allflex is using its range of purple secondary tags to show support for mental health charity, The Kaleidoscope Plus Group. With one pence from the sale of every set of the sheep or cattle purple secondary tags being donated to charity, Allflex hopes to raise £10,000. The Kaleidoscope Plus Group works to promote positive health and well being in communities, including those in remote and rural settings, and to provide appropriate services and support. Ashley Musgrave, Allflex UK general manager, said: “It is well documented that the agricultural community suffers one of the highest suicide rates in the UK, with loneliness, isolation and the lack of opportunity for communication all contributing factors. Mr Musgrave added that it is a legal requirement to tag all cattle and sheep and the company is asking livestock farmers to make a difference by ‘choosing purple’ for the next 12 months. The purple charity tags for cattle and sheep are available now at agricultural merchants and through Allflex representatives, so look out for them in the fields around where you live and work to see which farmers are supporting the initiative this year. Finally, a little bit of personal news. After seven years of writing this column, next week will see my final Farming Matters column, so I hope you will be able to join me then as I say goodbye.